After leading Princeton to the Final Four in 1965, Bill Bradley accepted a Rhodes Scholarship at Worcester College, University of Oxford. He believed that he was leaving the game behind and he would go months at a time without touching a basketball. As he neared the end of his second year of his studies, Bradley visited the Oxford gym and shot around by himself. He realized that despite all of his professional and personal aspirations, that sport fulfilled a need for self-actualization that nothing else could. That revelation motivated Bradley to put his career as a lawyer and politician on hold in order to join the New York Knicks (Bradley, 1995, p. 36). Albert Bandura commented “among the different aspects of self-knowledge, perhaps none is more influential in people’s everyday lives than conceptions of their personal efficacy (Bandura, 1986, p. 390). It might be assumed that a student who is confident in the classroom will also be a confident athlete on the playing field but that is not the case. Like homework is separate from sport practice, self-efficacy must be developed in parallel in both education and sport. Self-efficacy is an individual’s beliefs about their competence and the ability to execute a plan of action as a coping mechanism (Keogh, 1984, p. 1). Gifted students have high academic self-efficacy and expect to succeed in school but an investigation showed that this trait does not transfer to the playing field provided mixed results. There does not appear to be a gap in self-efficacy in how they feel about their abilities in each field but there is a definite discrepancy in terms of how they (Sternberg & Williams, 2002, p. 26). When competing with a team of similar ability, the gifted students-athletes under-achieved. Gifted learners often exemplify many positive study habits for a test but they do not prepare for an athletic event as rigorously. Players may have high personal self-efficacy but they do not have confidence in their teammates and give the opponent more credit than they deserve. The players did not display strong coping skills and the pressure of athletic competition proved detrimental to their fragile self-concept. Resolving these issues can lead to improved motivation in school and life, effective goal setting and reduced performance anxiety. Student-athletes on a senior boys basketball team in the Toronto area the subjects of this investigation. The players, males aged fifteen to seventeen, self-evaluated their self-efficacy and discussed their feelings about competition results in meetings, interviews, and survey forms. The Sports Competition Anxiety Test (S.C.A.T. ), a self-diagnosis test created by Rainer Martens to show some of the physiological signs of stress, was also administered (Martens, Vealey, & Burton, 1990, pp. 54-55). These results were supplemented with interviews and discussions with coaches and teachers. The gifted student-athletes held high, albeit fragile, personal self-efficacy. The players are able to correctly identify their strengths but tend to over-rate their sport-specific ability. Several coaches commented that the players in various sports held extremely high, sometimes inaccurate, opinions of themselves. Paradoxes abounded throughout the players’ responses. One player felt his teammates were determined and intelligent but added that they held a defeatist attitude about games. Another athlete, when asked the reasoning behind his competitive anxiety, drew a blank and admitted his nervousness had no basis in fact. According to the S.C.A.T. the athletes have low anxiety, but performance in games belied that self-diagnosis. The team’s apparently nervous, panicked reactions and reduced processing efficiency in games are indicators of anxiety (Murray & Janelle, 2003, p. 171). Although actual skill deficiencies may cause the poor athletic performance, gifted students are often able to catch up and close the gap (Rimm, 1990, p. 340). Gifted students often have high intrinsic motivation and self-efficacy for academic tasks (Sternberg & Williams, 2002, p. 349). These positive work habits can be applied in multiple disciplines when students are correctly motivated. Creativity: Gifted students have a higher creative self-efficacy those with average academic abilities. Although they perceive creative tasks as more challenging, they approach the activity with greater motivation and emotion (Urhahne & Ortiz, 2011, p. 174). Athletics provides an outlet for creativity in the sets and strategies employed. Teaching the players how to read the situation and react to it – not only what to do but how and why – can raise their confidence in themselves and their chances of success. The players need to feel that they have an additional edge and the capability to execute this style of play well. Self-efficacy was a common coping strategy and people avoided threatening situations that they believed exceeded their coping skills (Keogh, 1984, p. 2). In the case of many failures, individuals may attribute higher self-efficacy to others, such as teammates or opponents, who they feel are out of their league (Keogh, 1984, p. 6). Self-efficacy can predict how well an individual handles pressure as perceived incompetence may trigger an abandonment of any coping strategies (Keogh, 1984, p. 14). Martens devised a supplementary test, the Competitive State Anxiety Inventory (C.S.A.I.-2), to determine whether an individual is generally uneasy or whether they become nervous in response to a particular situation (Martens, Vealey, & Burton, 1990, pp. 166-8). The test includes both cognitive and somatic anxiety. The results of the C.S.A.I.-2 over the season show that stress is reduced and self-confidence increased as the players experienced success on the playing field. When competition becomes public, new anxieties arise (Firmin, Hwang, Copella, & Clark, 2004, p. 688). For example, a girls volleyball coach commented that the players experienced the most nervousness when serving, due to the silence in the gymnasium and the public focus on the competitor serving the ball. A student’s performance on a test is confidential between the teacher and pupil but an athlete’s performance in a game is known to everyone, immediately. High self-efficacy can lead to a raised level of arousal and vice-versa (Keogh, 1984, p. 5). Each student-athlete has a personal ideal level of arousal for competition and coaches must identify this level throughout the season. A combination of strategies should be employed, in conjunction with post-competition feedback, to help adjust arousal for optimal performance (National Coaching Certification Program, 1999, pp. 5.7-5.14). Super-Intensity: Gifted students face pressure to be extraordinary or perfect. To avoid under-achievement and promote self-efficacy, gifted learners should be taught the association between effort and outcome and mastery goals should be promoted (Rimm, 1990, p. 328). An increased challenge is necessary to help them reach the next level. Eventually, the challenge of a tough game will match the capabilities of a well-coached team and a state of flow will ensue (Clinkenbeard, 2012, p. 624). Sports can be a perfect medium to encourage a growth mindset. Raising the difficulty of a drill beyond what is required for that level of competition or creating practice situations that are more demanding than a game prepares players for adversity on the court. Basketball games have provided many cases when players have had to make extraordinary efforts to win or tie the game. Rehearsing these efforts and debriefing afterwards builds confidence among individuals and their teammates. Two video clips from the 2013-14 N.B.A. season showing the adversity faced by teams in the Western Conference. An example of poor chemistry is the attribution of poor performances to other causes. Students with low self-efficacy are more likely to attribute success and failure to dispositional or situational attributes (Smith, 2002, p. 10). Recently, during a loss, several players complained about their teammates after they had made mistakes on the court. In the locker room after the game, players spoke up and said that they felt that team members were trying to succeed individually at the expense of others. Other coaches mentioned that a similar lack of confidence in teammates appeared in other teams. In one-on-one meetings, players expressed difficulties in learning to trust each other. Although these instances reflect a serious flaw in team chemistry, the problem is not irreparable. When students make use of excuses, adults or authority figures must intervene to convince students they can achieve their goals and discourage attribution to external sources (Smith, 2002, p. 10). In sports, coaches must dispel any misconceptions student-athletes hold for their teammates and shut down the “blame game” before it begins. Work ethic and individual accountability are two of the greatest life lessons sports can impart across the curriculum. Attribution Retraining is a multi-step process that begins by creating rational expectations, clarifies the reasons behind each negative or positive result, and mitigates students’ emotional responses to the outcome. Teachers should not summarily dismiss feelings of attribution but persuade students to analyse the situation and their responsibility for the turn of events in greater detail (Buchanan & Sparling, 1993, p. 223). Locus of control is critical to the attribution of responsibility to self (Whitmore, 1980, pp. 179-80). Students should be encouraged to attribute their successes and failures to reasons that have an internal locus of control, stability, and controllability (Buchanan & Sparling, 1993, p. 223). In the classroom, teachers and coaches should steer children towards attributing failure to a lack of effort or preparation, instead of situational factors such as poor ability or bad luck (Chase, 2001, p. 47). When team or individuals set goals, all stakeholders must believe that the goals are achievable. If the goals are out of reach, there is little intrinsic motivation to succeed. If a student sincerely believes that they cannot achieve a benchmark, they will tune out any feedback or comments suggesting the opposite (Whitmore, 1980, p. 179). Recently, four team members who felt out of their league at a recent tournament showcased poor performances characterized by tentative and passive play, despite personal motivation speeches delivered before the game. 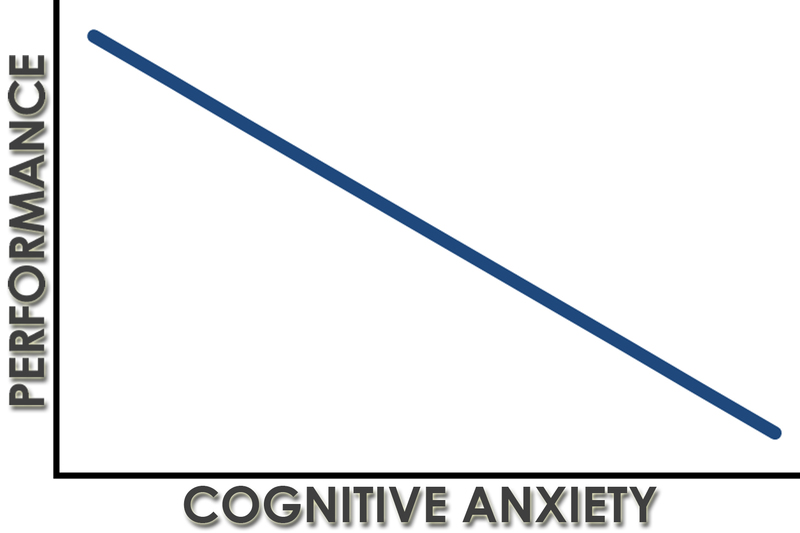 Mental training must address two types of anxiety: cognitive, for example worry or self-doubts, and somatic, the physiological symptoms of anxiety such as quickened breathing. 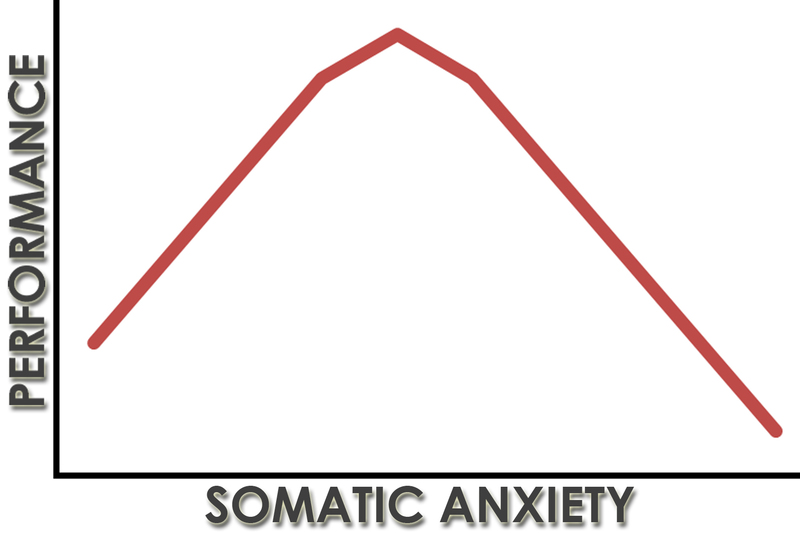 There is a negative linear correlation between cognitive anxiety and performance and there is an inverted U relationship between somatic anxiety and performance. 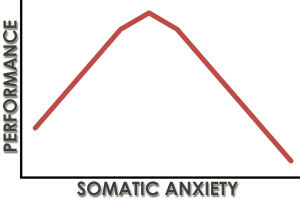 When the competition begins, somatic anxiety declines but cognitive anxiety may remain if the athlete possesses poor self-efficacy (Arent & Landers, 2003, p. 436). Coach Mental Training Skills: Although gifted students may seem to think critically about sport and how they feel, they may not know how to manage their anxiety in order to achieve an optimal level of performance. The head coach of a women’s university coach commented that the women’s basketball team had experienced difficulties transferring their academic intelligence and self-discipline to mental training situations. Another coach remarked that gifted-student athletes did not possess sufficient command of their mental training skills to appropriately adjust their level of intensity. The coach ensures each player finds their optimal level of arousal but the athlete is also accountable to maintain their level of activation. Somatic anxiety can be controlled with relaxation exercises such as deep breathing and techniques like positive self-talk or mental imagery reduce cognitive anxiety (Conroy & Metzler, 2004, p. 69). Adolescent students who develop greater self-control are more likely to achieve a state of flow, which can increase their enjoyment of the activity and their performance. Finding flow in one area of a teenager’s life can enable them to do the same in others (Kuhnle, Hofer, & Kilian, 2012, p. 536). This research highlights teaching implications for gifted students. For example, in physical education, an active kinaesthetic approach was very effective for talented athletes. All gifted students performed best when class was comprised of a variety of activities (Dunn, Griggs, & Price, 1993, pp. 133-4). Like any other person, gifted students need a supportive, positive environment (National Coaching Certification Program, 1999, pp. 5-7). Self-efficacy can only develop slowly over time (Keogh, 1984, p. 7) so work is always ongoing. When they fail, gifted students need to be encouraged to be optimistic. When they reflect upon the failure, they overestimate the difficulty or underestimate their abilities. They may assume a fixed mindset that nothing will change and that the failure is permanent (Tough, 2012, p. 98). Learned helplessness, includes three aspects: contingency or controllability of the circumstances, cognition or the attributions people make about the situation, and behaviour or whether individual persist in the face of failure. If a student experiences learned helplessness, they will fall short more frequently or give up more easily when difficulties are encountered (Firmin, Hwang, Copella, & Clark, 2004, p. 688). Self-efficacy expectations derived by from direct experience are very influential, compared to those developed by vicarious or symbolic experience or verbal persuasion. Furthermore, someone who over-values their ability risks attempting activities that are too advanced or out of reach (Keogh, 1984, p. 6). Analysing a game afterwards with skilled adolescents helps them discover their mistakes and learn from them, understanding more about the game as a result (Tough, 2012, p. 131). Post-Game Analysis: Gifted students can respond to objective measures of their performance, such as statistics or videos, when presented in a non-judgmental objective fashion. Allowing time to degrief, so that emotions dissipate, coaches should debrief games and explain what could be done the next time, fostering a growth mindset. Reviewing game situations in practice, but engineering a positive outcome assists coaches in building the self-efficacy of players. Gifted students share significant vulnerability with their non-gifted peers in addition to several factors related to their giftedness. Due to super-sensitivity or social deficits during their early years, gifted children may develop a sense of isolation and high needs for affiliation (Whitmore, 1980, p. 148). Students with high affiliation needs try to avoid public competition and risk taking (Sternberg & Williams, 2002, p. 365). A basketball team made up of high ability learners was surveyed to determine what strategies players used to achieve various levels of emotional control. These responses, in addition to visualization of the successful result of the game, were incorporated into the pre-game routine. At school, students receive elite instruction in subject-specific areas but cross-curricular material, such as performance anxiety or coping skills, is relegated to the background. Studies have outlined the negative effects that competition may have over gifted students. The students may become extremely self-critical to the point that repeated competition will erode their self-concept, even if they are successful. Often highly skilled people do not value positive competitive results as much as mastery goals (Clinkerbeard, 1995, pp. 198-9). The coach must determine the combination of winning, fun, and improvement that makes the team successful and navigate towards that goal. Ideal Performance State: Although the gifted curriculum is advanced, little attention is paid to coping with the pressure of an evaluation or performance. In sport, an Ideal Performance State (I.P.S.) is employed to help athletes control their psychological feelings. During an athletic competition, there are appropriate times to become focused at the task at hand, energized, or relaxed. The I.P.S. also includes good nutrition and a pre-competition routine (National Coaching Certification Program, 1999, pp. 5-31). There are many cross-curricular themes that came to light which supersede any subject-specific findings. Achievement and a positive self-concept are strongly correlated. The primary difference between under-achievers and successful people is self-esteem (Whitmore, 1980, p. 179). Gifted students need not trade achievement in the classroom for accomplishments in sport, art and other areas of their lives. Bill Bradley became an N.B.A. Champion, Olympic Gold Medalist and member of the Basketball Hall of Fame – as well as an Ivy League graduate, Rhodes scholar and U.S. Senator – by focusing on a series of goals, working hard and building self-efficacy by achieving them (McPhee, 1978, pp. 66-79). Each step was appropriate for his stage of development in each field and built on the foundations of the fundamentals. When Bradley arrived at the next challenge, on and off the court, he always felt confident in himself, his abilities and his teammates. It is important that student-athletes feel that they are successful because these beliefs are more important than anything a teacher or coach can say. Arent, S. M., & Landers, D. M. (2003). Arousal, Anxiety, and Performance. Research Quarterly for Exercise and Sport , 436-45. Bradley, B. (1995). Life on the Run. New York City: VIntage Books. Chase, M. A. (2001). Children’s Self-Efficacy, Motivational Intentions, and Attributions in Physical Education and Sport. esearch Quarterly for Exercise and Sport , 72 (1), 47-55. Clinkenbeard, P. R. (2012). Motivation and Gifted Students. Psychology in the Schools , 49 (7), 622-630. Conroy, D. E., & Metzler, J. N. (2004). Patterns of Self-Talk Associated With Different Forms of Competitive Anxiety. Journal of Sport and Exercise Psychology , 26 (1), 69-89. Dunn, R., Griggs, S. A., & Price, G. E. (1993). The Learning Styles of Gifted Adolescents in the United States. In R. M. Milgram, R. Dunn, & G. E. Price, Teaching and Counselling Gifted and Talented Adolescents (pp. 119-36). Westport: Praeger. Firmin, M., Hwang, C.-E., Copella, M., & Clark, S. (2004). Learned Helplessness. Education , 12 (4), 688-94. Keogh, R. (1984). Self-Efficacy: Underlying Mechanism of Behaviour Change and Determinant of Coping Behaviour. Thesis . Toronto, Ontario, Canada: University of Toronto. Kuhnle, C., Hofer, M., & Kilian, B. (2012). Self-control as predictor of school grades, life balance, and flow in adolescents. British Journal of Educational Psychology , 82 (4), 533–548. Martens, R., Vealey, R. S., & Burton, D. (1990). Competive Anxiety in Sport. Champaign: Human Kinetics. McPhee, J. (1978). A Sense of Where You Are. New York City: Farrar, Straus and Giroux. Murray, N. P., & Janelle, C. M. (2003). Anxiety and Performance. Journal of Sport and Exercise Psychology , 25 (2), 171–87. National Coaching Certification Program. (1999). Coaching Theory Level III. Gloucester: Coaching Association of Canada. Urhahne, D., & Ortiz, D. A. (2011). Motivation and Emotions of Gifted and Regular Students Performing a Creative Task. The Open Education Journal , 4 (s2), 171-178.